"Icteric" redirects here. For the physiological event, see Ictal. For the songbird Icteria, see Yellow-breasted chat. Causes of jaundice vary from non-serious to potentially fatal. Levels of bilirubin in blood are normally below 1.0 mg/dL (17 µmol/L) and levels over 2–3 mg/dL (34-51 µmol/L) typically results in jaundice. High bilirubin is divided into two types: unconjugated (indirect) and conjugated (direct). Conjugated bilirubin can be confirmed by finding bilirubin in the urine. Other conditions that can cause yellowish skin but are not jaundice include carotenemia from eating large amounts of certain foods and medications like rifampin. High unconjugated bilirubin may be due to excess red blood cell breakdown, large bruises, genetic conditions such as Gilbert's syndrome, not eating for a prolonged period of time, newborn jaundice, or thyroid problems. High conjugated bilirubin may be due to liver diseases such as cirrhosis or hepatitis, infections, medications, or blockage of the bile duct. In the developed world, the cause is more often blockage of the bile duct or medications while in the developing world, it is more often infections such as viral hepatitis, leptospirosis, schistosomiasis, or malaria. Blockage of the bile duct may occur due to gallstones, cancer, or pancreatitis. Medical imaging such as ultrasound is useful for detecting bile duct blockage. Treatment of jaundice is typically determined by the underlying cause. 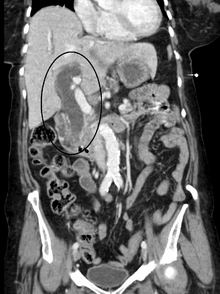 If a bile duct blockage is present, surgery is typically required; otherwise, management is medical. Medical management may involve treating infectious causes and stopping medication that could be contributing. Among newborns, depending on age and prematurity, a bilirubin greater than 4–21 mg/dL (68-360 µmol/L) may be treated with phototherapy or exchanged transfusion. The itchiness may be helped by draining the gallbladder or ursodeoxycholic acid. The word jaundice is from the French jaunisse, meaning "yellow disease". 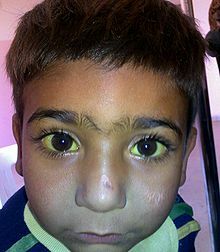 4-year-old boy with jaundiced (yellowish) scleras that later proved to be a manifestation of hemolytic anemia due to G6PD deficiency following fava bean consumption. The main sign of jaundice is a yellowish discoloration of the white area of the eye and the skin. Urine is dark in colour. Slight increases in serum bilirubin are best detected by examining the sclerae, which have a particular affinity for bilirubin due to their high elastin content. The presence of scleral icterus indicates a serum bilirubin of at least 3 mg/dL. The conjunctiva of the eye are one of the first tissues to change color as bilirubin levels rise in jaundice. This is sometimes referred to as scleral icterus. The sclera themselves are not "icteric" (stained with bile pigment), however, but rather the conjunctival membranes that overlie them. The yellowing of the "white of the eye" is thus more properly termed conjunctival icterus. The term "icterus" itself is sometimes incorrectly used to refer to jaundice that is noted in the sclera of the eyes; its more common and more correct meaning is entirely synonymous with jaundice, however. Hyperbilirubinemia, more precisely hyperbilirubinemia due to the unconjugated fraction, may cause bilirubin to accumulate in the gray matter of the central nervous system, potentially causing irreversible neurological damage leading to a condition known as kernicterus. Depending on the level of exposure, the effects range from clinically unnoticeable to severe brain damage and even death. Newborns are especially vulnerable to hyperbilirubinemia-induced neurological damage and therefore must be carefully monitored for alterations in their serum bilirubin levels. Hepatic/hepatocellular The pathology is located within the liver caused due to disease of parenchymal cells of liver. Post-hepatic/cholestatic The pathology is located after the conjugation of bilirubin in the liver caused due to obstruction of biliary passage. Pre-hepaticular jaundice is caused by anything that causes an increased rate of hemolysis (breakdown of red blood cells). Unconjugated bilirubin comes from the breakdown of the heme pigment found in red blood cells' hemoglobin. The increased breakdown of red blood cells leads to an increase in the amount of unconjugated bilirubin present in the blood and deposition of this unconjugated bilirubin into various tissues can lead to a jaundiced appearance. In tropical countries, severe malaria can cause jaundice in this manner. Certain genetic diseases, such as sickle cell anemia, spherocytosis, thalassemia, pyruvate kinase deficiency, and glucose-6-phosphate dehydrogenase deficiency can lead to increased red cell lysis and therefore hemolytic jaundice. Commonly, diseases of the kidney, such as hemolytic-uremic syndrome, can also lead to coloration. In jaundice secondary to hemolysis, the increased production of bilirubin leads to the increased production of urine-urobilinogen. Bilirubin is not usually found in the urine because unconjugated bilirubin is not water-soluble, so, the combination of increased urine-urobilinogen with no bilirubin (since, unconjugated) in urine is suggestive of hemolytic jaundice. Urine: no bilirubin present, urobilinogen > 2 units (i.e., hemolytic anemia causes increased heme metabolism; exception: infants where gut flora has not developed). Kernicterus is associated with increased unconjugated bilirubin not carried by albumin. Newborns are especially vulnerable to this due to increased permeability of the blood–brain barrier. Hepatocellular (hepatic) jaundice can be caused by acute or chronic hepatitis, hepatotoxicity, cirrhosis, drug-induced hepatitis and alcoholic liver disease. Cell necrosis reduces the liver's ability to metabolize and excrete bilirubin leading to a buildup of unconjugated bilirubin in the blood. Other causes include primary biliary cirrhosis leading to an increase in plasma conjugated bilirubin because there is impairment of excretion of conjugated bilirubin into the bile. The blood contains an abnormally raised amount of conjugated bilirubin and bile salts, which are excreted in the urine. Jaundice seen in the newborn, known as neonatal jaundice, is common in newborns as hepatic machinery for the conjugation and excretion of bilirubin does not fully mature until approximately two weeks of age. Rat fever (leptospirosis) can also cause hepatic jaundice. In hepatic jaundice, there is invariably cholestasis. Defects in bilirubin metabolism also leads to jaundice, as in Gilbert's syndrome (a genetic disorder of bilirubin metabolism that can result in mild jaundice, which is found in about 5% of the population) and Crigler–Najjar syndrome, Type I and II. Laboratory findings depend on the cause of jaundice. Urine: Conjugated bilirubin present, urobilinogen > 2 units but variable (except in children). Kernicterus is a condition not associated with increased conjugated bilirubin. Plasma protein show characteristic changes. Plasma albumin level is low but plasma globulins are raised due to an increased formation of antibodies. Bilirubin transport across the hepatocyte may be impaired at any point between the uptake of unconjugated bilirubin into the cell and transport of conjugated bilirubin into biliary canaliculi. In addition, swelling of cells and oedema due to inflammation cause mechanical obstruction of intrahepatic biliary tree. Hence in hepatocellular jaundice, concentration of both unconjugated and conjugated bilirubin rises in the blood. In hepatocellular disease, there is usually interference in all major steps of bilirubin metabolism—uptake, conjugation and excretion. Excretion is the rate-limiting step, however, and usually impaired to the greatest extent. As a result, conjugated hyperbilirubinaemia predominates. The unconjugated bilirubin still enters the liver cells and becomes conjugated in the usual way. This conjugated bilirubin is then returned to the blood, probably by rupture of the congested bile canaliculi and direct emptying of the bile into the lymph leaving the liver. Thus, most of the bilirubin in the plasma becomes the conjugated type rather than the unconjugated type, and this conjugated bilirubin, which did not go to intestine to become urobilinogen, gives the urine the dark color. Post-hepatic jaundice, also called obstructive jaundice, is caused by an interruption to the drainage of bile containing conjugated bilirubin in the biliary system. The most common causes are gallstones in the common bile duct, and pancreatic cancer in the head of the pancreas. Also, a group of parasites known as "liver flukes" can live in the common bile duct, causing obstructive jaundice. Other causes include strictures of the common bile duct, biliary atresia, cholangiocarcinoma, pancreatitis, cholestasis of pregnancy, and pancreatic pseudocysts. A rare cause of obstructive jaundice is Mirizzi's syndrome (gallstone impaction in the cystic duct or gallbladder neck, with the enlarged gallbladder squeezing on the common hepatic duct). In complete obstruction of the bile duct, no urobilinogen is found in the urine, since bilirubin has no access to the intestine and it is in the intestine that bilirubin gets converted to urobilinogen by microorganisms, with the urobilinogen later being partially reabsorbed from the intestine into the general circulation, and then excreted into the urine. In this case, presence of bilirubin (conjugated) in the urine without urine-urobilinogen suggests obstructive jaundice, either intra-hepatic or post-hepatic. The presence of pale stools and dark urine suggests an obstructive or post-hepatic cause as normal feces get their color from bile pigments. They can, however, occur in many intra-hepatic illnesses and are therefore not a reliable clinical feature to distinguish obstruction from hepatic causes of jaundice. Patients also can present with elevated serum cholesterol, and often complain of severe itching or "pruritus" because of the direct and indirect effects of pruritogens in bile such as bile salts. No single test can differentiate between various classifications of jaundice. A combination of liver function tests is essential to arrive at a diagnosis. Neonatal jaundice is usually harmless: this condition is often seen in infants around the second day after birth, lasting until day 8 in normal births, or to around day 14 in premature births. Typical causes for neonatal jaundice include normal physiologic jaundice, jaundice due to formula supplementation, and hemolytic disorders that include hereditary spherocytosis, glucose-6-phosphate dehydrogenase deficiency, pyruvate kinase deficiency, ABO/Rh blood type autoantibodies, or infantile pyknocytosis. Serum bilirubin normally drops to a low level without any intervention required. In cases where bilirubin rises higher, a brain-damaging condition known as kernicterus can occur, leading to significant disability. This condition has been rising in recent years due to less time spent outdoors. A Bili light is often the tool used for early treatment, which often consists of exposing the baby to intensive phototherapy. Sunbathing is effective treatment, and has the advantage of ultra-violet-B, which promotes Vitamin D production. Bilirubin count is lowered through bowel movements and urination, so frequent and effective feedings are especially important. Yellow discoloration of the skin, especially on the palms and the soles, but not of the sclera or inside the mouth is due to carotenemia—a harmless condition. Jaundice itself is not a disease, but rather a sign of one of many possible underlying pathological processes that occur at some point along the normal physiological pathway of the metabolism of bilirubin in blood. When red blood cells have completed their life span of approximately 120 days, or when they are damaged, their membranes become fragile and prone to rupture. As each red blood cell traverses through the reticuloendothelial system, its cell membrane ruptures when its membrane is fragile enough to allow this. Cellular contents, including hemoglobin, are subsequently released into the blood. The hemoglobin is phagocytosed by macrophages, and split into its heme and globin portions. The globin portion, a protein, is degraded into amino acids and plays no role in jaundice. Two reactions then take place with the heme molecule. The first oxidation reaction is catalyzed by the microsomal enzyme heme oxygenase and results in biliverdin (green color pigment), iron and carbon monoxide. The next step is the reduction of biliverdin to a yellow color tetrapyrol pigment called bilirubin by cytosolic enzyme biliverdin reductase. This bilirubin is "unconjugated," "free" or "indirect" bilirubin. Approximately 4 mg of bilirubin per kg of blood is produced each day. The majority of this bilirubin comes from the breakdown of heme from expired red blood cells in the process just described. Approximately twenty percent comes from other heme sources, however, including ineffective erythropoiesis, and the breakdown of other heme-containing proteins, such as muscle myoglobin and cytochromes. The unconjugated bilirubin then travels to the liver through the bloodstream. Because this bilirubin is not soluble, however, it is transported through the blood bound to serum albumin. Once it arrives at the liver, it is conjugated with glucuronic acid (to form bilirubin diglucuronide, or just "conjugated bilirubin") to become more water-soluble. The reaction is catalyzed by the enzyme UDP-glucuronyl transferase. This conjugated bilirubin is excreted from the liver into the biliary and cystic ducts as part of bile. Intestinal bacteria convert the bilirubin into urobilinogen. From here urobilinogen can take two pathways. It can either be further converted into stercobilinogen, which is then oxidized to stercobilin and passed out in the feces, or it can be reabsorbed by the intestinal cells, transported in the blood to the kidneys, and passed out in the urine as the oxidised product urobilin. Stercobilin and urobilin are the products responsible for the coloration of feces and urine, respectively. It is unclear how common jaundice is among adults. Most patients presenting with jaundice will have various predictable patterns of liver panel abnormalities, though significant variation does exist. The typical liver panel will include blood levels of enzymes found primarily from the liver, such as the aminotransferases (ALT, AST), and alkaline phosphatase (ALP); bilirubin (which causes the jaundice); and protein levels, specifically, total protein and albumin. Other primary lab tests for liver function include gamma glutamyl transpeptidase (GGT) and prothrombin time (PT). Some bone and heart disorders can lead to an increase in ALP and the aminotransferases, so the first step in differentiating these from liver problems is to compare the levels of GGT, which will only be elevated in liver-specific conditions. The second step is distinguishing from biliary (cholestatic) or liver (hepatic) causes of jaundice and altered laboratory results. The former typically indicates a surgical response, while the latter typically leans toward a medical response. ALP and GGT levels will typically rise with one pattern while aspartate aminotransferase (AST) and alanine aminotransferase (ALT) rise in a separate pattern. If the ALP (10–45 IU/L) and GGT (18–85) levels rise proportionately about as high as the AST (12–38 IU/L) and ALT (10–45 IU/L) levels, this indicates a cholestatic problem. On the other hand, if the AST and ALT rise is significantly higher than the ALP and GGT rise, this indicates an hepatic problem. Finally, distinguishing between hepatic causes of jaundice, comparing levels of AST and ALT can prove useful. AST levels will typically be higher than ALT. This remains the case in most hepatic disorders except for hepatitis (viral or hepatotoxic). Alcoholic liver damage may see fairly normal ALT levels, with AST 10x higher than ALT. On the other hand, if ALT is higher than AST, this is indicative of hepatitis. 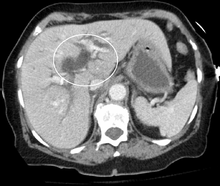 Levels of ALT and AST are not well correlated to the extent of liver damage, although rapid drops in these levels from very high levels can indicate severe necrosis. Low levels of albumin tend to indicate a chronic condition, while it is normal in hepatitis and cholestasis. Lab results for liver panels are frequently compared by the magnitude of their differences, not the pure number, as well as by their ratios. The AST:ALT ratio can be a good indicator of whether the disorder is alcoholic liver damage (above 10), some other form of liver damage (above 1), or hepatitis (less than 1). 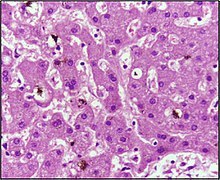 Bilirubin levels greater than 10x normal could indicate neoplastic or intrahepatic cholestasis. Levels lower than this tend to indicate hepatocellular causes. AST levels greater than 15x tends to indicate acute hepatocellular damage. Less than this tend to indicate obstructive causes. ALP levels greater than 5x normal tend to indicate obstruction, while levels greater than 10x normal can indicate drug (toxic) induced cholestatic hepatitis or Cytomegalovirus. Both of these conditions can also have ALT and AST greater than 20× normal. GGT levels greater than 10x normal typically indicate cholestasis. Levels 5–10× tend to indicate viral hepatitis. Levels less than 5× normal tend to indicate drug toxicity. Acute hepatitis will typically have ALT and AST levels rising 20–30× normal (above 1000), and may remain significantly elevated for several weeks. Acetaminophen toxicity can result in ALT and AST levels greater than 50x normal. Jaundice comes from the French jaune, meaning yellow, jaunisse meaning "yellow disease". The medical term for it is icterus, from the Greek word ίκτερος; adjectival form, icteric. ^ a b c Bassari, R; Koea, JB (7 February 2015). "Jaundice associated pruritis: a review of pathophysiology and treatment". World Journal of Gastroenterology. 21 (5): 1404–13. doi:10.3748/wjg.v21.i5.1404. PMC 4316083. PMID 25663760. ^ a b c d e "Jaundice". MedlinePlus. Archived from the original on 27 August 2016. Retrieved 13 August 2016. ^ a b c d e f g h (Prof.), Roger Jones (2004). Oxford Textbook of Primary Medical Care. Oxford University Press. p. 758. ISBN 9780198567820. Archived from the original on 2017-09-08. ^ a b c d Ferri, Fred F. (2014). Ferri's Clinical Advisor 2015: 5 Books in 1. Elsevier Health Sciences. p. 672. ISBN 9780323084307. Archived from the original on 2017-09-08. ^ a b Buttaro, Terry Mahan; Trybulski, JoAnn; Polgar-Bailey, Patricia; Sandberg-Cook, Joanne (2012). Primary Care: A Collaborative Practice (4 ed.). Elsevier Health Sciences. p. 690. ISBN 0323075851. Archived from the original on 2017-09-08. ^ "Facts about Jaundice and Kernicterus". CDC. February 23, 2015. Archived from the original on 8 August 2016. Retrieved 13 August 2016. ^ a b c Winger, J; Michelfelder, A (September 2011). "Diagnostic approach to the patient with jaundice". Primary care. 38 (3): 469–82, viii. doi:10.1016/j.pop.2011.05.004. PMID 21872092. ^ a b Maisels, MJ (17 March 2015). "Managing the jaundiced newborn: a persistent challenge". CMAJ : Canadian Medical Association Journal. 187 (5): 335–43. doi:10.1503/cmaj.122117. PMC 4361106. PMID 25384650. ^ a b Roche, SP; Kobos, R (15 January 2004). 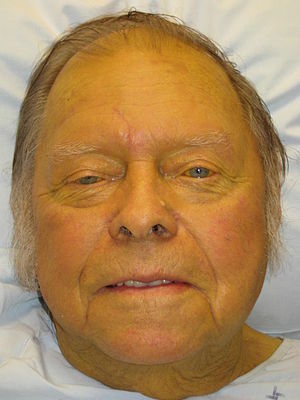 "Jaundice in the adult patient". American Family Physician. 69 (2): 299–304. PMID 14765767. ^ Dr. Chase's Family Physician, Farrier, Bee-keeper, and Second Receipt Book,: Being an Entirely New and Complete Treatise ... Chase publishing Company. 1873. p. 542. Archived from the original on 2017-09-08. ^ Goroll, Allan H. (2009). Primary care medicine : office evaluation and management of the adult patient (6th ed.). Philadelphia: Wolters Kluwer Health/Lippincott Williams & Wilkins. p. 496. ISBN 9780781775137. Archived from the original on 2017-09-08. ^ a b "Definition of Icterus". MedicineNet.com. 2011. Archived from the original on 7 August 2012. Retrieved 3 February 2013. ^ Icterus | Define Icterus at Dictionary.com Archived 2010-12-31 at the Wayback Machine. Dictionary.reference.com. Retrieved on 2013-12-23. ^ Shinde, MN Chatterjea, Rana (2012). Textbook of medical biochemistry (8th ed.). New Delhi: Jaypee Brothers Medical Publications (P) Ltd. p. 672. ISBN 978-93-5025-484-4. ^ Beckingham, I J (2001). "ABC of diseases of liver, pancreas, and biliary system: Investigation of liver and biliary disease". BMJ. 322 (7277): 33–6. doi:10.1136/bmj.322.7277.33. PMC 1119305. PMID 11141153. ^ Bassari R, Koea JB (2015). "Jaundice associated pruritis: A review of pathophysiology and treatment". World J. Gastroenterol. 21 (5): 1404–13. doi:10.3748/wjg.v21.i5.1404. PMC 4316083. PMID 25663760. ^ Goljan, Edward F. (2007) Rapid Review Pathology, 2nd ed., Elsevier Health Sciences, pp. 368–369, ISBN 032304414X. ^ Llewelyn, Huw; Ang, Hock Aun; Lewis, Keir; Al-Abdullah, Anees (2014). Oxford Handbook of Clinical Diagnosis. Oxford University Press. p. 18. ISBN 9780199679867. Archived from the original on 2017-09-08. ^ Bertini, G.; Dani, C.; Tronchin, M.; Rubaltelli, F. F. (2001). "Is Breastfeeding Really Favoring Early Neonatal Jaundice?". Pediatrics. 107 (3): E41. doi:10.1542/peds.107.3.e41. PMID 11230622. ^ Click, Rachel; Dahl-Smith, Julie; Fowler, Lindsay; DuBose, Jacqueline; Deneau-Saxton, Margi; Herbert, Jennifer (2013). "An osteopathic approach to reduction of readmissions for neonatal jaundice". Osteopathic Family Physician. 5 (1): 17–23. doi:10.1016/j.osfp.2012.09.005. ^ Sumida, K.; Kawana, M.; Kouno, E.; Itoh, T.; Takano, S.; Narawa, T.; Tukey, R. H.; Fujiwara, R. (2013). "Importance of UDP-Glucuronosyltransferase 1A1 Expression in Skin and Its Induction by UVB in Neonatal Hyperbilirubinemia". Molecular Pharmacology. 84 (5): 679–86. doi:10.1124/mol.113.088112. PMC 3807078. PMID 23950218. ^ Salih, Fadhil M. (2001). "Can sunlight replace phototherapy units in the treatment of neonatal jaundice? An in vitro study". Photodermatology, Photoimmunology and Photomedicine. 17 (6): 272–7. doi:10.1034/j.1600-0781.2001.170605.x. PMID 11722753. ^ Nakayama, Juichiro; Imafuku, Shinichi; Mori, Tatsuki; Sato, Chiemi (2013). "Narrowband ultraviolet B irradiation increases the serum level of vitamin D3in patients with neurofibromatosis 1". The Journal of Dermatology. 40 (10): 829–31. doi:10.1111/1346-8138.12256. PMID 23961975. ^ O'Keefe, Lori (May 2001). "Increased vigilance needed to prevent kernicterus in newborns". American Academy of Pediatrics. 18 (5): 231. Archived from the original on 2007-09-27. ^ a b Pashankar, D.; Schreiber, R. A. (2001). "Jaundice in Older Children and Adolescents". Pediatrics in Review. 22 (7): 219–26. doi:10.1542/pir.22-7-219. PMID 11435623. ^ Ahmad, Jawad; Friedman, Scott L.; Dancygier, Henryk (2014). Mount Sinai Expert Guides: Hepatology. John Wiley & Sons. ISBN 9781118742525. Archived from the original on 2017-09-08.